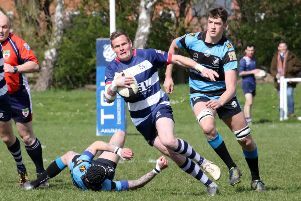 Brackley returned from Bedford Swifts on the back of a 19-12 defeat in Saturday’s Midlands Four East South fixture. Brackley travelled to rivals Swifts in what is always a tight encounter and Saturday’s fixture proved to be no different. The visitors allowed Swifts to dominate the early proceedings before mounting a second half challenge which just fell short in the end. A sluggish start from Brackley and what was quite the opposite from Swifts saw the home side establish a 14-0 advantage inside the first 15 minutes. With Brackley finding a foothold in the game, both sides battled the difficult slippery conditions but the visitors were unable to get on the scoreboard. After the restart, Brackley gained confidence as the game progressed, with the possession percentages increasing opportunities to exploit a narrow Bedford defence. James Giddins came off the bench and caused havoc changing the dynamics of the scrum and adding some hefty carries in the midfield. However a deft fly hack down the touchline and a turn of pace which was enough to beat the lame efforts of the winger, Giddins chased the ball in from 30 metres and dived on the ball bringing the scores within touching distance at 14-12. The game was back in the balance with ten minutes on the clock and Brackley one penalty from edging in front. But a lack of composure and the ability to keep hold of the ball allowed the home side to go over for the final score which ended any hopes of Brackley completing the comeback.